Join Nationwide Boiler at this year’s California League of Food Processors 2012 Expo & Showcase of Processed Foods. This two day event at the Sacramento Convention Center (January 31 & February 1, 2012) will showcase nearly 200 tradeshow exhibits, thousands of food samples, and will provide informative sessions with industry expert speakers. Kicking off the event will by Gen Y Guy® Jason Ryan Dorsey, speaking on “Crossing the Generational Divide” during the Kick-Off Breakfast on Tuesday, January 31. Nationwide Boiler’s Sales and Marketing team will be on hand in booth #436 to answer any questions relating to the company’s extensive product line of rental, new, and reconditioned boilers systems. Be sure to ask about Nationwide Boiler’s CataStak SCR system and BPS boiler systems, designed to allow food processors to easily comply with strict emission reduction rules and fulfill energy efficiency goals for the New Year. Visit Nationwide Boilers website to request a FREE visitor pass to the exhibit hall (eligible to processors and growers only). We look forward to seeing you at the show! Tuesday, January 10, 2012 from 2-3 pm EST, the US Department of Energy is holding a free Webcast for Industry: Key Energy-Saving Activities for Smaller Facilities. The webcast will focus on key energy-saving activities that small- to medium-sized manufacturers can implement in their facilities. The webcast, featuring Richard Feustal of Briggs & Stratton and an Industrial Assessment Center Representative, will highlight strategies such as implementing no-cost energy savings measures. Space is limited, so reserve your webinar seat now! The National Board Incident Report recently indicated that 79 percent of all reported boiler accidents were attributed to two causes: low water cutoff, and operator error/poor maintenance. A low water cutoff condition occurs when the water level in the boiler steam drum drops below a pre-set safe level (as determined by the boiler manufacturer) and, in turn, shuts off the boiler. This condition, and the subsequent cause, should be investigated and corrected immediately. Failure of this safety control may result, at a minimum, in costly tube or vessel repairs, or, in the worst cases, catastrophic boiler and building damage and personnel injury or death. Avoiding the above conditions is critical to ensuring safe and reliable boiler operation. Maintenance, inspection, and operational logs are recommended and required by insurance companies. These records not only help determine boiler performance trends, but also keep operators focused on the safe performance of the boiler and auxiliary plant equipment. To this end, unnecessary boiler downtime (together with the loss of plant production) and lost time accidents are avoided. Our main priority is to provide customers with safe and reliable rental and new boiler and steam plant equipment. We have many operational procedures in place that help us achieve this goal. For instance, each piece of rental equipment is thoroughly inspected before and after a rental project. Our inspection and maintenance checklists cover all of the mechanical and electrical systems, including feedwater systems, water softeners, chemical systems, and the trailers themselves (for mobile equipment such as our mobile boiler rooms). In addition, critical parts, including low water cut-offs, constantly undergo inspection and testing. If found to be faulty, they are either immediately repaired or replaced. The only way to avoid premature downtime and accidents (in the worst cases) is to make certain that operators and plant owners are committed to an on-going operational and preventative maintenance programs. The Hartford Steam Boiler website www.hsb.com is a good resource. Turning a blind eye to safe boiler operations puts operators, company employees, and equipment at unnecessary risk. Nationwide Boiler has achieved yet another safety milestone – 2,500 days without a loss time accident! This marks the longest length of time Nationwide has gone without an accident in our forty-four years of operation. The company maintains a shop facility of 26,000 sq.ft., used for the maintenance, repair and assembly of boiler systems and auxiliaries. Nationwide Boiler’s Experience Modification Rate (EMR), a benchmark measure used for insurance premium discounts that compares worker compensation claims to other employers of similar size operating in the same type of business, has greatly improved over the last seven years. 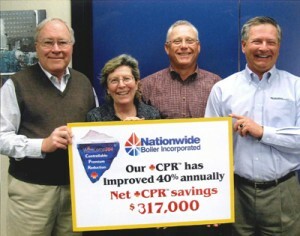 To date, Nationwide Boiler has realized a cumulative cost savings of over three-hundred-thousand dollars as a result of the company's commitments to safety.